We have 2 types of keychains that you can fully customize: the embroidered keychain and the woven keychain. They are 100% customizable with a wide choice of fabric colors for the background and borders (optionnal). You can insert texts and logos at your convenience, both front and back. Depending on the complexity of the logo (or image) to be integrated on the keyring, it will be necessary to choose the weaving method rather than embroidery (which is generally used by default) because weaving allows to obtain more details and precision during the manufacturing process. What is the difference between embroidery and woven method ? Embroidered keychains are using different embroidery threads. Basically, one thread is used for each different color. For example, on the image below, one thread is used for the background (red), one for the border (blue) and one for the text (white). Woven keychains are using only one thread (except for the border), whatever the number of colors. 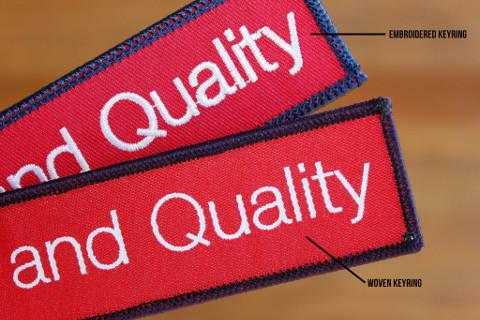 It means that we will have a better precision with woven rather than embroidered keychain and will manage to print very small texts and complex logo. High quality keyrings with a raised embroidery effect. Many options are available to personalize your red flight keys at your image ! Compared to standard embroidery mode, the details are faithfully reproduced. This solution offers better precision rendering without constraint of content or color. Woven keyring can includes small outline text, gradient effects or shades. The main difference with a standard embroidered keyring is that there's is no "raised effect" with weaving.